The largest department in May Hardware is paint, paint sundries and accessories. A broad assortment of high quality paints and stains, the latest mixing and color matching system and highly trained personnel means that your painting project will turn out right. Interior and exterior paints by Ace Clark & Kensington and Valspar headline the paint department. Both lines of paint have a fantastic color assortment and come in many different finishes to get "the look" that is just right for your special project. Our premier exterior stain is Cabots. Available in water base and oil base, semi transparent and solid coat, Cabots is a top quality exterior protection product. Sikkens exterior finishes are also stocked. The spray paint assortment is huge. Whether it is a standard oil base enamel, water base, XO Rust 2X for plastic, camo paint, inverted marking paints, primer, etc - we have lots. Of course you will need the tools to remove and apply paint. We have a broad assortment. 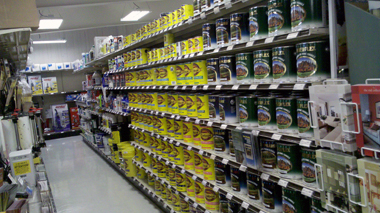 The paint section has everything the homeowner or professional needs. Tapes, caulks, glues, drywall finish products, roofing repair, waterproofers, sanding products, thinners, strippers, tile products, flooring adhesives, and many others.